Twenty-four teens are forced to enter. Only the winner survives. In the ruins of a place once known as North America lies the nation of Panem. Survival is second nature for sixteen-year-old Katniss Everdeen, who struggles to feed her mother and younger sister by secretly hunting and gathering beyond the fences of District 12. When Katniss steps in to take the place of her sister in the Hunger Games, she knows it may be her death sentence. If she is to survive, she must weigh survival against humanity and life against love. Awesome book, I couldn't stop reading it. It has a lot of action. What I like about this book is that Katniss never gave up even though she faced some hard situations. Yes, I would recommended this book others because it shows how hard life could be sometimes, but you never have to give. People who like a lot of action would like this book. Clash of Kings is a continuation of the novel Game of Thrones. In this book, the houses of Westros gears up for war as the king in the North attempts to win independence from King Joffrey. Meanwhile, Stannis Bartetheon asserts his rule from the island fortress of Dragonstone and tries to wrench the loyalty of the lords of storm's end from his brother Renly. Across the sea, Daenerys Targaryen guides her people and her dragons with hopes of reclaiming her families throne. This is an incredible book because it is full to the brim with vivid descriptions of battles, events, and plots from the point of view of the characters across the world. It is full of plot twists and realistic characters that have their own histories and secrets. I recommend this book to anyone who is a fan of fantasy or war stories. Or if you want something that will keep you up all night turning the pages, then look no further. In the third installment of the Game of Thrones series, Storm of Swords heats up the tension between the warring kingdoms of Westros. As King Joffery tries to maintain his hold on the iron throne, an army of Wildlings masses in the north beyond the wall. As the Nights Watch pleads for assistance, the war only heats up as lords become more anxious about the war and how it might end. I loved this book because it was action packed and kept me guessing until the very last page! I would recommend this book to anyone who likes fantasy or historical fiction and does not want to be spared the gory details. This is book four in the Percy Jackson series. Percy, now 15, hurries to Camp Half-Blood where he is sent on a quest through the Labyrinth to protect his camp from the army of lord Kronos. This book is interesting because the plot is really good all the way to the climax. I recommend this book to anybody who is interested in Greek mythology and wants a good book to read. 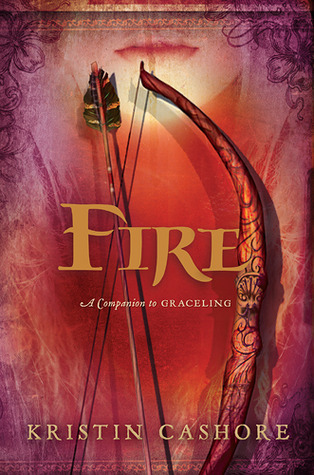 Fire is a human monster--unearthly in her beauty, she charms everyone around her to the point that it's dangerous. Even though she has the ability to control anyone's mind, her life isn't that great, either. With an infamous monster father and relationship troubles between an old friend and a new unlikely one, she struggles to find herself in a time of war and strife. Fire was pretty good overall. Like Graceling, its companion novel, it is spun in the same world and has an intricate, complex plot. It's a little darker than the first book (though you don't have to read it to understand it) and it does have some inappropriate moments, so beware. If you like fantasy or if you've read Graceling, you would definitely enjoy this book. Due to the content, I would rate it for 8th graders and up. In the third installment of the Inheritance Cycle, Eragon encounters old enemies and new as well as some unexpected friends as he seeks to fight for the good and stop Galbatorix once and for all. With the help of his dragon Saphira, he embarks on yet another quest--but this time, his enemy may just be himself. As an avid follower of the Inheritance Cycle, I was pretty excited when this came out years ago. However, I was let down by the fact that the plot not only seemed to die down, but none of the chapters captured me except the part where the "Brisingr" part of the title comes into play. If you like fantasy, dragons, magic, and action, this series is for you, but be warned that the books get worse as they go. I can only hope that the last book will rectify everything and restore Eragon's world to its former glory. Also, these are very thick books (Harry Potter size) so if you don't like big books, I'd try with something else. Mockingjay is the last book in the Hunger Games series and picked up right where it left off in Catching Fire. Mockingjay was all about the rebels and how they are trying to take over Panem and rule the country. Katniss has many decisions to make, including whether she wants Gale or Peeta. She is as determined as ever in this book to kill President Snow, but must decide if she likes President Coin! Overall, Katniss is amazing and so is this book!! Itwas amazing and overall perfect. It was very interesting because it makes you think how nice our civilization really is. It made me think about my little sister and how much I really care about her, just like Katniss does to Prim. The book had the perfect ending! Yes, I would recommend this series to everyone, whether you are a boy or girl! Mockingjay, by Suzanne Collins, has the perfect combination of romance and fighting and is perfect for anyone! !